Text and photos by Stephanie Levin. 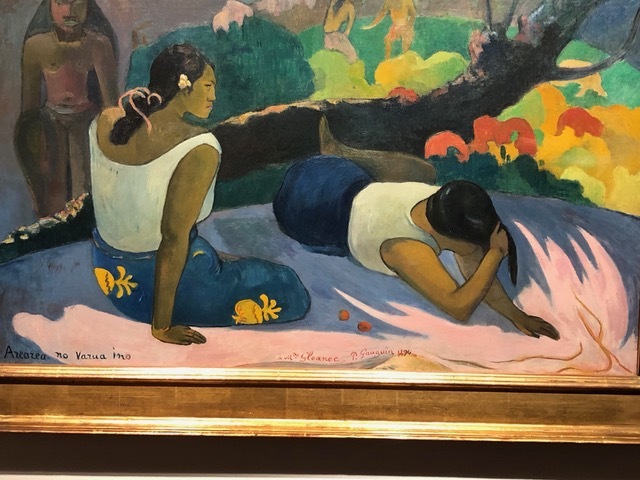 French painter and Post-Impressionist, Paul Gauguin, cultivated and inhabited two images, one a sensitive artist, the other a self-imposed outcast, and in Gauguin: A Spiritual Journey, currently on exhibit at the De Young Museum in San Francisco, (November 17, 2018-April 7, 2019) the viewer experiences Gauguin’s spiritual journey through both his paintings and sculptures. The exhibit, which includes paintings, wood carvings and ceramics are from the renowned Ny Glypotek collection in Copenhagen. Gauguin never achieved artistic fame in his lifetime (1848-1903), it came after his death. Nor did he cultivate his artistic abilities until much later in life. He was first a stockbroker, married, Mette-Sophie, a Danish woman with whom he had five children. After financial difficulty, the family moved to Denmark where Gauguin painted part-time while working as a business man to support his family. His business failed and his marriage suffered. Understanding Gauguin’s passion for art, Mette agreed to let Gauguin return to France to follow his passion. The two never reunited, communicated often, and never divorced. Mette, the sole breadwinner, also was the person responsible for bringing much of Gauguin’s art to public attention. In France, Gauguin was mentored by Camille Pissarro whose paintings are part of the exhibit. It was Pissarro who encouraged Gauguin to participate in an early Impressionist exhibition in 1879. 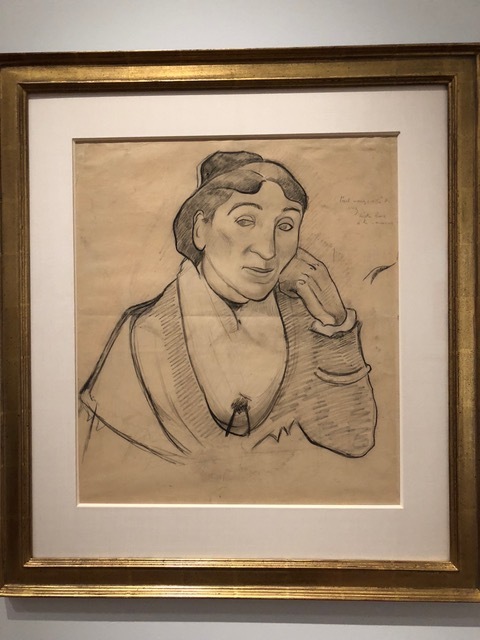 Around the same time period, Gauguin befriended Van Gogh and spent a summer painting side-by-side with him, but it was Emile Bernard who later helped Gauguin develop his own distinctive style of painting, a style characterized by areas of flat fields of color separated by darker lines. As he developed his style , the peripatetic artist was restless and seeking a more direct relationship with nature. He had spent time in Brittany, where he felt at ease with the more rustic and wild aspect of the Britannic countryside. He had lived in Peru as a child, his mother’s birthplace, a country unencumbered by European decor. 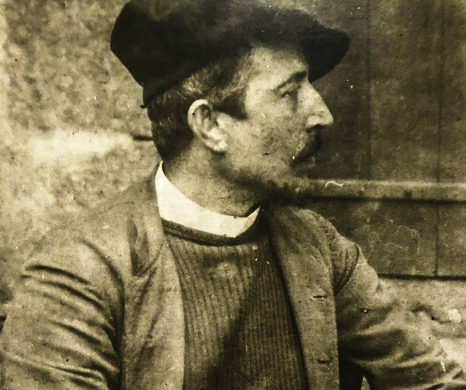 As an adult, Gauguin, the self-educated painter and self-taught master of color theory turned his back on European art and traveled to non-Western countries and cultures- Panama and Martinique- before settling on Tahiti in 1890 as his artistic destination. Influenced by Pacific art and culture, his carvings and images on view are a testament to his bond with the Polynesian culture. For the viewers who think of Gauguin as only a painter, they will be pleasantly pleased with his wood carvings and ceramics displayed throughout the exhibit. Cumulatively, the exhibit represents both Gauguin’s spiritual journey and his artistic quest to achieve recognition. 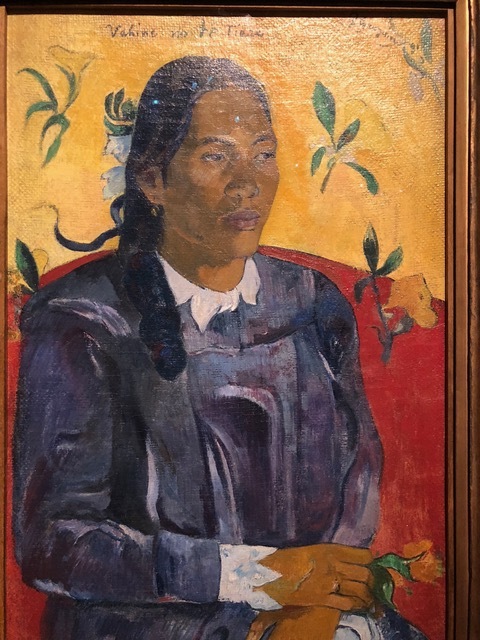 The stylistic European portrait of Tahitian Woman with a Flower is one of Gauguin’s first paintings when he arrived in Tahiti in 1891. The free-floating flowers in the background create a sense of tropical tenderness and beauty. As part of his spiritual journey, Gauguin was eager to learn the customs and beliefs of the Tahitian people, and one experiences this throughout the exhibit. One of the most interesting paintings in the exhibit is Reclining Tahitian Women. I have seen this painting before, but did not truly understand the symbolism in the painting. Do sit through the brief video of contemporary Marquez women and men discussing the painting, emphasizing the black river that runs through the painting. Does it represent evil or an ominous sign? You will come away from the video with a new perspective on this famous painting. Gauguin’s spiritual journey fueled his artistic passion and determination to be an accomplished artist, and the exhibit takes the viewer through his quest from beginning to end. One of the first paintings is that of Still Life with Flowers, which draws the viewer’s eye to an abstract bedpost, a clue to Gauguin’s evolution as a Symbolist, often seen in his future work. Why a bedpost? That is exactly the question one ponders. The span of Gauguin’s work, his exploration of new ideas in his quest to succeed as an artist is on full display in this exhibit. 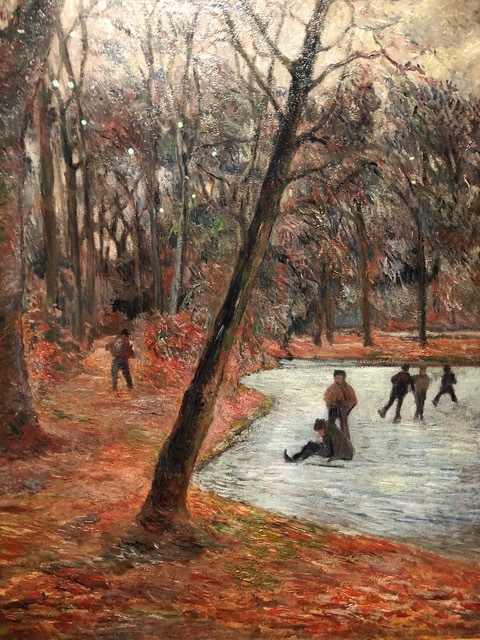 As you meander through the exhibit, which begins with his early years in Copenhagen, note the painting Skaters in Frederiksberg Gardens (1884). It’s a beautifully rendered winter scene, the ground coiled in a blaze of orange autumn, the light in the sky through the naked trees reflecting on the ice and skaters. 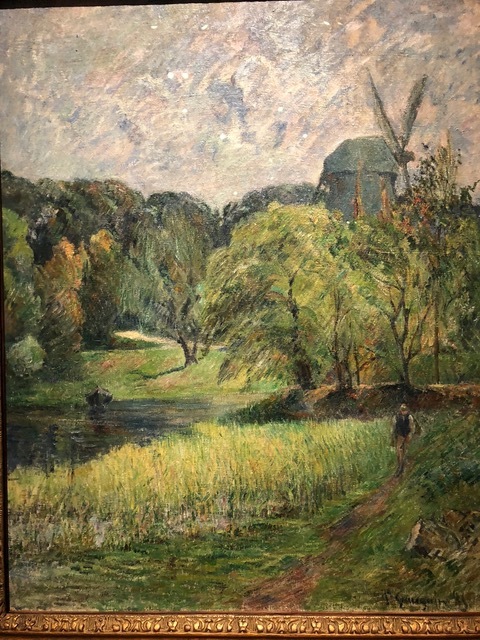 In the spring, Gauguin paints The Queen’s Mill, Østervold in Copenhagen ( 1885,) and writes to Pissarro that he feels his painting has made progress; it’s more luminous. Indeed, the eye is drawn in by the luminosity, the movement dancing across the light sky as it crowns the green countryside. Nevertheless, Gauguin couldn’t find a buyer for his painting in Copenhagen. Juxtaposing both the colorful winter scene and soft summer scene is The Woman from Arles, Madame Ginoux, a black, white and colored chalk with charcoal on paper drawing of the proprietor of a café in Arles where Gauguin and Van Gogh, painted together in 1888, four years after the Skaters in Frederiksberg Gardens. 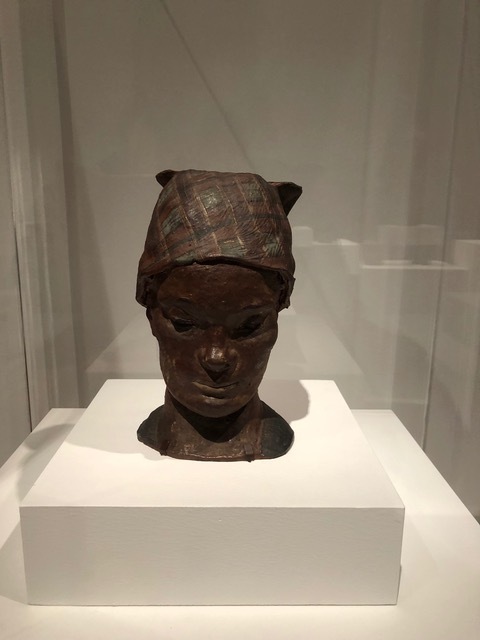 The journey into Gauguin’s work wends through a period when he focused on carvings.Iin particular, one stunning carving is based on a sketch he made of a woman from his time in Martinique, titled Portrait Head. Gauguin’s spiritual journey ultimately ends in the Marquesas where he hoped to find a place not “swamped by European civilization.” And it is, at the end of this journey, the paintings we most associate with Paul Gauguin: the colorful rounded beautiful Polynesian women, the vibrant, flat colors on the canvas full of symbolism and life. Thanks for this illuminating introduction to the exhibit. We are looking forward to seeing it this weekend. David, I hope you enjoy it as much as I did. Thank you! I already feel like I know more about Gauguin than I did before! I look forward to the exhibit.